The author's original annotation to Appendix D was written in 2000 and published in this multimedia archive in 2001; an abridged version of that annotation appeared in her second edition of the 'Ephelia' texts (Ashgate Publishing Group, UK, 2003; ISBN 0 7546 0839 5; https://www.ashgate.com/shopping/title.asp?key1=&key2=∨ig=results&isbn=0%207546%200839%205, with recent reviews). The annotation is now expanded here (posted July 5, 2005) to reflect a new find of the author's in the Thomason Tracts (British Library); page three of this 1660 tract and of the tract's (enlarged) factotum are imaged below. This new piece of physical evidence (located June, 2005) would appear to secure the author's attribution of the 1679 broadsheet poem (imaged above; ESTC R40072) as being a new addition to the corpus of writings by the "Ephelia" poet, whom the author has proposed to be Lady Mary Villiers, later Stuart, Duchess of Richmond & Lennox (1622-1685), known as "the Butterfly," a pet-name given her in the mid-1630s by the future Charles II, owing to an amusing prank of hers in the royal gardens (D'Aulnoy, Mémoires, 2 vols [Paris, 1695]). As documented earlier in this archive and in other publications by the author, the 'brisk and jolly' 'Mall' Villiers was personally and politically engaged in the turmoil of the long and bloody l7th century. A member of the royal Stuart household and a highly placed member of the Stuart inner circle, the charismatic Mary Villiers was well practiced in the arts of court intrigue. This cosseted daughter of Stuart court favorite, George Villiers, first Duke of Buckingham, breathed the air of courts since childhood. Not only was she First Lady of the Bedchamber to Queen Henrietta Maria, whom she deeply admired and personally emulated (see Image 11a and Image 11b ), but Her Grace of Richmond effectively served the Stuart administration as a conduit and courier of privileged intelligence during the Civil Wars and during the negotiations which culminated in the Secret Treaty of Dover (see Image 7 , an ink sketch, 1890, of Mary and George Villiers, he disguised as Merry Andrew, in the streets of Cromwell's London). 'Mall' Villiers worked hand-in-glove with her best of childhood friends, Charles II, and with her younger brother, George Villiers, second Duke of Buckingham, in their many intrigues. Political by breeding and temperament, and with a strong penchant for the rising feminist beliefs of the day, 'Mall' Villiers impressed her contemporaries as being the most "rejouissante" ("amusing") and cleverest woman of her century (PRO 31/3/108, folios 124-5; D'Aulnoy, Mémoires, 2 vols [Paris, 1695]); Freda Hast, ODNB, 2004, http://www.oxforddnb.com/articles/56/56054-nav.html). This 1679 factotum (or this style of 'generic' factotum, possibly commemorating, in its original state, a royal match) would appear to enjoy a special role in two anonymous political texts of the Restoration: (i) the broadsheet poem presented above, namely, A Poem as it was Presented To His Sacred Majesty On the Discovery of the Plott. Written by a Lady of Quality. Printed in the year 1679 ([London]: s.n., 1679; ESTC R40072; Wing P2668), with "H" factotum; and (ii) a new text in recent commentary on the 'Ephelia' matter, being an eight-page anonymous essay (pamphlet) on the arraignment in 1660 of the 1649 regicides, which valuably displays an earlier variant of this same factotum, A Hue and Cry After the High Court of Injustice. Or, The Arraignment and Sentence of those … Traitors, who …condemned the late Kings Majesty, Charles I … with a perfect List of all their Names… (London: John Andrews, 1660; Thomason Tracts 152:E.1025 ), with "T" factotum. In both instances, the factotum which ornaments the 1660 and the 1679 texts appears to be dated to the reign of Charles I, as suggested primarily by the style of dress of both figures in the device and especially, in the 1660 factotum, the representation of the king figure, most particularly his elaborate Van Dyck-style moustache and goatee-style beard. Furthermore, it does appear from certain physical details, that the 1660 and the 1679 factotums could have been slightly altered or emended by the woodcutter (not an uncommon practice at that time) from a much earlier device of, say, circa 1625, in order to change the original device into a factotum (note that an arm is missing from both miniature figures in order to create space for an inserted letterpiece; see Philip Gaskell on such practices in early presswork, A New Introduction to Bibliography [Oxford UP, 1972], "Decoration & Illustration," p. 155). In the case of the 1679 "H" factotum (the broadsheet poem, above), it appears that the earlier 1660 factotum received small but strategic emendments by the printer's woodcutter in order to make this much-earlier decorative device more compatible with the poem's addressee (Charles II) and the poem's concealed author (its "Lady of Quality," Mary Duchess of Richmond, in her ducal coronet). As the style of dress would indicate, the two figures in the original device (before it was a factotum) were very probably Charles I and Henrietta Maria, each displaying an extended arm, and clasping hands; an image of this style of representation of a royal match (the clasping hands) appears in a line engraving, c. 1662, commemorating the union (May, 1662) of Charles II and Catherine of Braganza, on the National Portrait Gallery website, http://www.npg.org.uk/live/search/person.asp?search=ss&sText=charles+II&LinkID=mp00841&role=sit&page=10 (see image D11128). When this same style of text decoration was selected in 1660 for the Hue and Cry pamphlet, the device was altered to create a factotum (as mentioned, note the critical detail of the missing arm on each figure; and it is entirely possible, of course, that the original ornament, before it was a factotum, was altered before 1660). When the same style of factotum was selected in 1679 for the Popish Plot poem (above), the block was slightly emended by the woodcutter to more accurately represent the poem's royal addressee and its ducal authoress. These few but distinguishing details in the 1679 "H" factotum will be identified below. The anonymous royalist authors of the 1679 broadsheet poem on the Popish Plot (imaged, above) and the 1660 prose tract on the disposition of the regicides (p 3 and enlarged factotum, below) were not merely writing propaganda pieces for the Stuart monarchy, but rather expressing deeply held personal concern in the destiny of an entire nation. We can reasonably deduce the identity of one of these anonymous royalist writers in Lady Mary Villiers (a de facto Stuart, effectively), who made a serious personal investment in the continuance of the House of Stuart all of her long life. For background information on the Popish Plot conspiracy, the larger subject behind this new poem in the 'Ephelia' corpus, readers may consult John Philipps Kenyon's The Popish Plot (London: Heinemann, 1972; London: Phoenix Press, 2001; http://www.members.tripod.com/stromata/id75.htm), as well as the author's essay in her updated edition of 'Ephelia''s work (Ashgate UK, 2003). With gracious permission from the Huntington Library, the author introduces in Appendix D of this multimedia archive an important addition to the corpus of 'Ephelia''s writings, A Poem as it was Presented To His Sacred Majesty On the Discovery of the Plott. Written by a Lady of Quality. ([London]: s.n., 1679; ESTC R40072; Wing P2668. 1/2º. With woodcut device, being an illustrated (or figural) factotum with inset letterpiece "H" (hereafter, "the 1679 H factotum"). Essential Background. This 1679 broadsheet poem by a "Lady of Quality," addressed to Charles II on the Popish Plot hysteria, comes down to us today with an elaborate publication history. The poem exists in three different states of publication. (1) The poem first appeared on the London market in 1678, in a handsome, dual-column broadsheet format (1º, 50 lines), without factotum (see Image 1 of this archive), under the title, A Poem To His Sacred Majesty, On the PLOT. Written by a Gentlewoman (ESTC R218925; Wing [CD Rom, 1996], P2031). Owing to its explicit political content and the volatile temper of the times, the poem evidently received a measure of special handling: its bookseller (or publisher) was Henry ('Harry') Brome, a prominent royalist Master stationer, at The Gun, St Paul's Churchyard; and the poem was licensed by the King's new royal censor, Roger L'Estrange, "Nov.23.1678," as stated at the foot of the sheet. Brome's printer is not identified in this particular Brome imprint. (2) The poem was republished in 1679, without factotum but with one critical textual variant in the poem's closing line (identified and discussed, below), in Female Poems…by Ephelia (8vo, William Downing for James Courtney: [Easter-term], 1679; Second Edition, with large Additions, 1682, Golden Horse-Shoe, Saffron Hill), pages 1-3. And (3) a special, illustrated version of the poem (with "H" factotum), for presentation to Charles II and also displaying the one important textual variant in the poem's closing line, was prepared and printed in 1679, very probably before this 1679 octavo of collected verse was put on the London market; this presentation copy for the King appeared in the state which we see above: a privately printed and privately published broadsheet (1/2º, incomplete imprint [only the publication date is supplied]), with "H" factotum), "Written by a Lady of Quality." As the title of this 1679 broadsheet poem implies, this new addition to the 'Ephelia' corpus is a copy of the "Lady of Quality"'s presentation copy of the poem, "as it was Presented" to Charles II. This poem is a new addition to the 'Ephelia' corpus and this is the version of the poem which concerns us here, in Appendix D.
Because of the complexity of this poem's bibliographical situation and its interpretive variables, the rest of this annotation is hereby presented in discrete bibliographical units. 1679 "H" Factotum (enlarged). A Poem…To His Sacred Majesty…On the Plott. Written by a Lady of Quality (1/2º. [London]: s.n., 1679). Huntington Library copy. as it was printed in 1679, at the opening of Appendix D, above. 2. Cataloguing Information (bibliographical records): ESTC R40072 (record constructed, July, 2001). Wing CD-ROM, 1996, P2668; Wing Reel Position 1660:02. Early English Books Online (proprietary database: subscribers only); ( http://gateway.proquest.com/openurl?ctx_verg=Z39.88-2003&res_id=xri:eebo&rft_id=xri:eebro:citation 18687314; Harvard copy). In 2001, the ESTC records linked (or cross-referenced) an earlier version of this poem (Henry Brome imprint, licensed "Nov.23.1678") and this new (1679) poem attributed to the 'Ephelia' poet. 3. Recorded Locations (to date): British Library, Bodleian (2 copies), Huntington (Howard S. Mott copy, acquired 1978, $350), Beinecke, and Harvard. (Harvard's is a 'dummy reproduction,' according to ESTC R40072; this copy, slightly damaged at the margin, unaffecting text; the record for this poem in Early English Books Online images the Harvard copy). (i) Titular Variants: Against its parent-poem of 1678, the title of the 1679 broadsheet version (imaged above, being the new addition to the writings of 'Ephelia'), is changed in two important ways. First, the title identifies the 1679 poem as a copy of the poem as it appeared as a presentation copy: "A Poem as it was Presented to…." Charles II. This later, 1679 title also identifies the poem as being the author's (its 'Lady of Quality''s) response to "the discovery" of the Popish Plot; this critical word, "discovery", was not included in the earlier, 1678 title of the poem. In 1678, the rumor of a general Catholic (or 'papist') plot to assassinate the King and recatholicize England shook the London citizenry and the Stuart administration; by 1679, formal inquiries into the conspiracy had flushed out enough intelligence and depositional evidence to identify the conceptors and perjurors behind the hoax, primary Titus Oates (see John Kenyon, The Popish Plot, [London: Heinemann, 1972; London: Phoenix Press, 2001], Ch.3, The High Tide of the Plot, pp. 177-204). 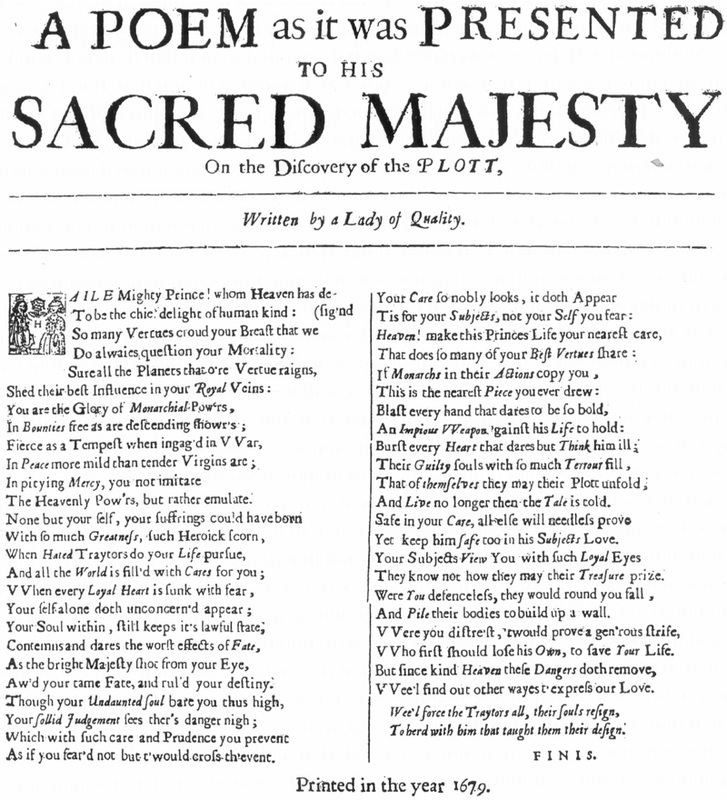 In Female Poems..by Ephelia (Easter-term, 1679), the 1679 broadsheet version of the poem is reprinted with no textual variants, but without the ornament and with a slightly modified title, "A Poem Presented To his Sacred Majesty on the Discovery of the Plot" (pp 1-3). (ii) Authorship Variant: In the Brome imprint of this poem, being the poem's first or original text of 1678, the author's credit line is "Written by a Gentlewoman." In the anonymously-printed 1679 broadsheet poem, the author's credit line is, "Written by a Lady of Quality." In Female Poems On several Occasions. Written by Ephelia (8vo, 1679), the poem is given the lead position in a collection of verses "Written by Ephelia." Clearly, and as the work of Elaine Hobby showed in the 1980s, the "Gentlewoman" who wrote the Popish Plot broadsheet poem, published by Brome in 1678, was the same "Ephelia" who included the poem, but with one critical textual variant and a slightly amended title, in the 1679 collection, Female Poems…by Ephelia (Hobby, A Virtue of Necessity [London, 1988]). While many readers, even yet, hold to the rather old, retrograde view of 'Ephelia' as a thoroughly invented writer, constructed by a clever cabal of Restoration wits, the author of this archive and a growing number of colleagues read the rare 'Ephelia' texts as the work of an actual, corporeal woman writer, highly placed in Stuart court culture with a set of observable poetic habits and strong political and feminist beliefs, notwithstanding her amusing forays now and again into polyvocality and double masquerade. She voices, e.g., "Celadon" (perhaps Mary Villiers' good friend, George Porter) in the poem, "The Reply, by a Friend"; she also is the abandoned "Lady" ('Mall' Kirke) in the famous lamentation to "Bajazet" (the libertine, John [Sheffield], Lord Mulgrave]). Is it not a sad and discouraging commentary on the literary establishment that when men poets assume a multivocal persona (Lord Rochester, writing in female voice, e.g. ), they are praised for virtuosity and poetic craft, but when a woman poet of this era, such as Mary Villiers ('Ephelia'), adopts a multivocal persona, she is denied a single identity and accused of being many hands all at once? (iii) Textual Variant: The most critical substantive variant in the 1679 broadsheet version of this poem is the poet's closing line. In 1678, the poem concluded with a generalized allusion to the Popish Plot conspirators: "We'll force the Traytors all, their Souls resign, / To herd with them that taught them their Design" (emphasis supplied). In 1679, the poet refers to one plotter alone, assigning responsibility to a single individual: "We'll force the Traytors all, their Souls resign, / To herd with him that taught them their design" (emphasis supplied). The "him" of the closing line is very probably Titus Oates, who, by 1679, had been identified as a chief instigator of the Popish Plot conspiracy; but, as the author noted in her updated edition of 'Ephelia''s work (Ashgate UK, 2003), there is another (quite attractive) candidate for this reference: Anthony Ashley Cooper, first Earl of Shaftesbury, considered by Charles II to be the "wickedest dog in England" (Chambers, Biographical Dictionary , p 1162). Shaftesbury never denied his quiet role in the sweeping anti-Catholic fervor of the late 1670s: "I will not say who started the Game, but I am sure that I had the full hunting of it" (J R Jones, The First Whigs , p 23). So critical is this variant in the 1679 version that the two lines are emphatically formatted: they are set off from the body of the text as an indented couplet, on both sides (the type size of the two lines is slightly reduced in order to affect this formatting change). This was not the formatting of the poem in 1678, as published by Brome, where the poem concluded with a more neutral reference. Comparing the 1679 broadsheet version of this poem against its presentation as the lead poem in the collection, Female Poems…by Ephelia (8vo; London: Wm Downing for James Courtney, 1679, 1682), pp 1-3 ( Image 2), we find that the text is identical, including the important "him" in the closing line. (The slight titular variant of the poem in the 1679 octavo is identified above. (v) Printing & Production Variants: In 1678, the parent-poem of the 1679 broadsheet poem, imaged above (the new poem in the 'Ephelia' corpus), was published, without factotum or ornament, by Henry Brome in a handsomely assembled, dual-column broadsheet format (1º); as mentioned, the printer is not identified at the foot of the sheet ( Image 1). In 1679, a variant of this broadsheet poem, which concerns us here in Appendix D, was again published, also in broadsheet format, but (compared to the version released under Brome's imprint) it was given a reduced representation (1/2º; ESTC R40072; size in cms, specified above). In 1679, the poem was again printed, this time for the octavo, Female Poems…by Ephelia, where it appears over three pages (pp 1-3, with catchwords "In," If," "AN") and without factotum or ornament. Owing to differences in orthography, we may deduce that Brome's printer on the 1678 version was not the anonymous printer of the 1679 broadsheet version: Brome's printer used the more common spellings of "Plot" and "Hail," unlike the concealed printer of the 1679 broadsheet who used "Plott" and "Haile." Likewise for James Courtney's printer, William Downing, the printer/compositor of the 1679 version of the poem for Female Poems…by Ephelia. Only the anonymous printer of the factotum broadsheet version of the poem in 1679 set "Plot" and "Hail" as "Plott" and "Haile." The most remarkable physical variant in the presswork of the three physical states of this poem (Brome brs., 1678; anonymous brs., 1679; Courtney imprint, 1679) is the ornament (woodcut device/"H" factotum) which graces the 1679 broadsheet version, "Written by a Lady of Quality." In addition to a slightly changed title in the 1679 broadsheet version of the poem -- a title amended to reflect the occasion of the poem's transmission as a presentation copy to the King, and also to reflect the swiftly accelerating circumstances of the Plot inquiry, from rumor to "discovery" to suspects -- the 1679 version includes a figural factotum which did not appear in the parent version of the poem in 1678; nor is it included in the poem's reappearance in the octavo collection, Female Poems…by Ephelia (Easter-term, 1679) Thus, the 1679 broadsheet version of the poem, bearing this device, is indeed quite a special moment in the evolution and history of this particular privately prepared and privately published text. Page 3, A Hue and Cry After the High Court of Injustice. Anon. with permission (27th July 2005). with permission (5th July 2005). Enlarged Image of Factotum, following. Enlarged Image of 1660 "T" Factotum. But, of course, the two figures in the 1679 "H" factotum do not entirely correspond to this earlier 1660 factotum representation of Charles I and Henrietta Maria. The King and Lady in the 1679 "H" factotum appear to have received a few minor but critical changes, evidently by the printer's woodcutter in order to make the factotum more compatible with its special occasion, being the presentation to Charles II of a loyal and updated poem against the Popish Plot by 'Ephelia' (Lady Mary Villiers). First, let us speak of the royal moustache. Comparing the 1679 "H" factotum with an earlier representation of this figural factotum, being the 1660 "T" factotum (John Andrews' imprint, imaged above), one does not require the high-tech agency of a stereoscopic or binocular microscope to see that the King figure in both factota are slightly different: the elaborate moustache of Charles I, correctly represented in the factotum device on the first page of text in the 1660 tract (and also in the tract's frontispiece portrait of Charles I), is dramatically reduced in the 1679 factotum (there's simply less of it). This could have been an emendment to the earlier block, at the publisher's behest, in order to make the King figure more representative of Charles II, especially for a presentation copy to the King. For Stuart moustaches, the reader may consult numerous images of royal tastes in facial hair on the website of the National Portrait Gallery; for Charles I's great and noble 'stash,' one may survey the 148 images of the King, at ( http://www.npg.org.uk/live/search/person.asp?LinkID=mp00840). For images of his son's different style of whiskers, see any of 169 images of Charles II, at http://www.npg.org.uk/live/search/person.asp?LinkID=mp00841. This small facial emendation to the face of the King in the 1679 broadsheet factotum is purposeful: it serves as an immediate visual guide for the reader to the subject and addressee of the poem (Charles II); it also distinguishes this factotum from its precedent of 1660 (the "T" factotum, above). Why was the early-Stuart costume of Charles I also not altered for the later, 1679 "H" factotum? Speed and urgency of publication must be the answer. As we know from the Popish Plot collections of Narcissus Luttrell, the English press in the late 1670s was inundated by Popish Plot material (cartoons, tracts, poetry, songs, etc.). The inquiry was moving along swiftly, and one imagines that the author of the 1679 broadsheet poem in this Appendix D was keen to get her updated poem presented to Charles II before it was outdated. Turning now to the crowned woman figure in both factota, we see that she, too, is differently represented, particularly with respect to one obvious detail. The crowned queen, facing Charles I, in the 1660 Hue and Cry tract, is distinctively dark (brunette); the representation of her hair by the woodcutter accords with contemporary images of Queen Henrietta Maria (the reader may scan the 34 images associated with Henrietta Maria on the National Portrait Gallery website, http://www.npg.org.uk/live/search/person.asp?search=ss&sText=henrietta+maria&LinkID=mp02137). The crowned woman in the 1679 "H" factotum broadsheet, however, is not dark-haired; compared to the representation of Charles II's hair, hers is obviously much lighter; and we know that Mary Villiers, the author's candidate for the 'Ephelia' poet, was fair-haired (light red-blond; see this archive's Frontispiece Portrait). The extent to which the crowned Lady's facial features also were slightly emended to more closely correspond to those of the vivacious Mary Villiers, Duchess of Richmond (see, e.g., Image 8), the author wisely leaves to specialists in the graphic arts medium. In any case, it would seem that these two small but critical emendments to the 1660 factotum woodblock - the changes to the King's moustache and to the representation of the color of the crowned Lady's hair - distinguish these two related factota as serving distinctly different political settings and different textual 'masters.' It is not the least surprising that the 1679 "H" factotum, evidently figuring Charles II and Mary Villiers, was not used in the Brome imprint of the poem in 1678 nor in the Courtney imprint of the poem in 1679: the "H" factotum simply said too much, it was too disclosing. And this is why the device enjoys the status of a 'smoking gun': it suggests the identity of the concealed figure behind the poem's credit line: "Written by a Lady of Quality." Little wonder that this new, 1679 broadsheet poem was so closely held. As Roger E. Stoddard reminds us in Marks in Books, "'chains of scholarly reasoning sometimes begin with evidence that is very fragile'" (Cambridge, MA: Houghton Library, Harvard University, 1985), p. 2. This new poem in the corpus of 'Ephelia's writings was republished for the first time since 1679 in the author's updated 'Ephelia' edition (Ashgate, 2003) and also in a stunning new anthology on the practice of 'reading' pages in women's history (text, manuscript, decorative arts), Reading Early Modern Women: An Anthology of Texts in Manuscript & Print, 1550-1700, edited by Helen Ostovich and Elizabeth Sauer (NY & London: Routledge, 2004; some 80 'pages' with facsimiles and facing commentary). 5. Transmission: Only six copies of this privately printed, privately published, and anonymously written 1679 broadsheet poem have survived. One must wonder how such a closely held poem moved from the cautious hands of its concealed author (its "Lady of Quality", the 'Ephelia' poet, very probably Mary Villiers, later Stuart, Duchess of Richmond) into the public domain. At present, this feature of the poem cannot be satisfactorily addressed until further information becomes available. Yet, one thing is clear, surely, from what may be reasonably inferred from the authorship and publication practice of its concealed author: this individual was a most protective guardian of her writings and, owing to her high rank and insider links to the Stuart inner circle, she had the privileged rank and access to control the printed presentation, publication, and transmission of her work. If this 1679 factotum broadsheet became available to history in a few extant copies, those copies were either unauthorized releases, emanating from the anonymous printer or from the anonymous publisher, or Mary Villiers herself strategically distributed ('floated') but a few copies of the poem among her inner circle in order to assure an eventual place in the literary record for this special presentation copy of her poem. The addition of an illustrated device on the 1679 broadsheet version of her Popish Plot poem to Charles II was a graphic allusion to her identity; and the fact that the 1679 "H" factotum does not appear in the representation of this same poem in Mary's poetry-book of 1679, the famous Female Poems…by Ephelia, is not the least surprising. The power and purpose of this factotum device in the 1679 presentation copy to Charles II is patent, if viewed and 'read' contextually as a graphic (pictorial) clue to the poem's authorship in the Duchess of Richmond. Judging by wholes, not parts, readers are asked to weigh all aspects of the Villiers case, not merely this one new poem of 1679 with its interesting (emended) factotum. It is the overall correspondence between the writings of 'Ephelia' -- the political allegiances, the autobiographical allusions, the veiled personages in the Villiers-Stuart circle -- and the life and times of Mary Villiers which grounds the larger argument. Though the author's formulations enjoyably include a 'flashpoint', a 'eureka piece', even a 'smoking gun', it is the poet's own disclosures (in the mediums of printed text and the pictorial arts) which have created a case for her concealed identity. Valuing historical fact and physical evidence, the author of this archive has undertaken in Appendix D to establish something of the precedents of the illustrated ("H") factotum which graces the closely-held presentation copy of the Popish Plot broadside poem (s.n., 1679) addressed to Charles II and "Written by a Lady of Quality," namely the 'Ephelia' poet (very probably Mary Villiers, later Stuart, Duchess of Richmond and Lennox, 1622-1685). As noted earlier, this sensitive political poem on a religious and political crisis in the Stuart administration offers 17thC print historians a valuable locus of the evolution of a literary text over three separate states of publication: (i) the handsome Brome imprint, without illustration (broadsheet, 1678; this is the parent text of the two subsequent variants in 1679; see Image 1 in this archive); (ii) the closely-held presentation copy of the poem to Charles II, also in broadsheet format, "Printed in the year 1679" and "Written by a Lady of Quality" (author, publisher, printer all unidentified), with one substantive textual variant in the closing line and with an illustrated factotum (digital image, above, courtesy Huntington Library); and (iii) a second published appearance of the poem in 1679, in Female Poems…by Ephelia (8vo; London: Wm Downing for John Courtney, 1679, 1682; Image 2), where it is presented as the lead poem in the collection, without substantive variants to the body text, compared against the 1679 broadsheet version of the poem, and without the (revealing) illustrated factotum which appears on the important presentation broadsheet version of the poem in 1679 (digital image, above). This poem on the Popish Plot crisis, authored ostensibly by a woman, was commercially available on the London market in 1678 (the Brome imprint) and in 1679 (the Courtney imprint); but the 1679 presentation copy of the poem, whose 'smoking gun' factotum surely appears to gesture to the poem's addressee and author, was not on the public market because the factotum suggested the poem's authorship in Lady Mary Villiers. This was a closely-held poem, a special communication between two old friends of the Stuart inner circle: Charles II and his best of childhood chums, the 'brisk and jolly' 'Mall' Villiers. In the above Annotation to Appendix D, this author demonstrated that the 1679 factotum evidently had been converted or restyled from a much earlier ornament, reasonably a clasping-hands-design device, circa 1625, commemorating the union of Charles I and Henrietta Maria. (The author has not as yet found, in McKerrow, Plomer, Miller, or in the EEBO database, such an ornament; and this is not unusual, as the ornament might have been designed and cut for a privately printed and privileged piece on this new alliance between the Houses of Stuart and Bourbon; indeed, the original pattern could be French, not English. Continued delvings may prove fruitful.) The author also demonstrated in the above Annotation that the 1679 "H" factotum was not unique (not a one-off), but that it had a history of precedents: the device had been used before 1679 by at least one other tradesmen in the Restoration print culture and very probably a few others not as yet identified. One such location, as shown above, is an anonymous pro-Stuart tract of 1660, A Hue and Cry (Thomason Collection, British Library), on the disposition of the regicides of Charles I, published by John Andrews at the White Lion at Pie Corner, London (see also, Stationers' Register [rpt., 1967], 'Index,' V). Even in the modern digital medium, which can distort the original production quality of a 17thC image, one observes that the presswork on the "T" factotum by Andrews' printer (page 3, Hue and Cry) is not the best quality. The factotum image is quite dark, suggesting heavy inking or an inferior ink; also, the Andrews factotum of 1660 shows signs of age and deterioration, and accidental damage: observe the noses of both crowned figures, as well as the line breaks in the top border line and also at the upper right-hand corner. Nonetheless, the selection of this old factotum of (perhaps) the 1620s is entirely suitable and correct in a publication of 1660 as the content of the 1660 Hue and Cry tract emanates from the reign of Charles I and his consort. This compatibility between text and text illustration is underscored by the inclusion of a full-page frontispiece of Charles I (head and bust), facing the title-page of this 1660 work. Thus, this old factotum of (perhaps) the 1620s does indeed 'work', in context. It is suitable and it serves the text it ornaments. The author is now pleased to present further information on the history of this same factotum with the recent discovery on 12th July 2005 of a second precedential location of the device in a popular book on exemplary women of ancient Rome (1663; 12th ed., 1700), with apparently a prestigious (though, as yet, unestablished) posthumous authorship in one of 17thC England's best students of Italian history and culture: the great art collector and arts patron, Thomas Howard, 14th Earl of Arundel (1585-1646). Aside from the historical fact of this additional precedent, the new find also invites a fresh set of observations and inferences which would seem to further support the author's original conclusion in 2001 that the 1679 factotum in the Popish Plot broadsheet serves as the 'smoking gun' of the Villiers case. Thomas Howard's Seven Wise Mistrisses . . .
London: M[ary] Wright, King's Head, Old Bailey, 1663. Signature B.
Huntington Library Copy, RB 55251. With gracious permission, 3rd August 2005. Digital Copy of this page, Early English Books Online / ProQuest. With gracious permission, 13th July 2005. 1660, Hue and Cry 1663, Seven Mistrisses 1679, Popish Plot brs. Comparing the 1660 Hue and Cry factotum and its later incarnation in 1663, the 1663 representation is more sharply defined, owing mostly to better presswork or machining (i.e., less heavy inking). Also Mary Wright's (unidentified) printer of the Seven Mistrisses in 1663 may have directed the woodcutter to make a few slight alterations to the surface of the factotum's block; e.g., the design of the King's crown is slightly different; the two stems of the English rose appear to be a bit longer and also straighter; the crowned woman figure displays a slightly longer neck and less heavily inked hair; the angle of her head inclines more to the (viewer's) left; and her cleavage is minimized. Comparing the 1663 factotum with its re-appearance in 1679, on the presentation copy of a poem to Charles II, the factotum apparently underwent further alterations. (Can age, decay, machining, and different presswork account for all of these many different variables?) Two essential and distinguishing emendments appear to have been made to the block in 1679. With regard to the King figure, as represented in the 1679 device, the moustache is minimized to align with that of the poem's addressee and subject, Charles II; portrait images which display his facial hair are supplied in links, above, in the Annotation. (Other incidental changes: the design of the King's crown in the 1679 image is slightly different; the arched left eyebrow [viewer's left] is no longer visible, doubtless a sign of wear or damage, not an aesthetic decision, surely; and the outline and volume of the King's hair, to the left of the royal face [viewer's left], has been modified.) Notably, the King figure's beard was never inked in any of the three representations of the factotum; in the 1679 display, the white area which in 1660 and in 1663 suggested the beard of Charles I, now suggests the white cravat typically seen in portraits of Charles II, thus making this old and dated factotum more appropriate to the current monarch in 1679, style of dress notwithstanding. (For images of the white cravat in most portraits of Charles II, see the link in the Annotation, above, to the National Portrait Gallery website). Mary Wright was the last known and recorded user of this factotum -- or of a factotum of this same design -- in 1663; and her printer of choice, judging from Wright's records in the EEBO, was Ralph Wood; e.g., Bunyan, A Few Sighs (1658); Cawdrey, The Account Audited (1658); Pererius, The Astrologer (1661); and Donne's Satyr… Printed by R.W. … [very probably Ralph Wood], (1662). Whether she or one of her several kin in the Restoration print trade were the publisher of this 1679 broadsheet poem to Charles II, engaging again Ralph Wood as printer or one of his kin in the trade, must remain speculative at present. Regardless, there is the historical fact now established of Wright's printer in 1663 (and also John Andrews' printer, in 1660) as having had access to this device. With regard to the incorrect formatting of line 5 in the 1679 presentation copy of the Popish Plot broadsheet ("Sureall" [i.e., "Sure all"] in line 5 should align with "Shed," in line 6; see digital copy of the poem, above), this conspicuous blemish on an otherwise attractively designed broadsheet poem was either a careless compositor and proofing error or, given the shape and relatively large size of this important space in the poem, a different device altogether was originally planned, such as a large decorative initial "H" (incipit: "HAILE Mighty Prince! ..."): note the unused space below the poem's factotum. 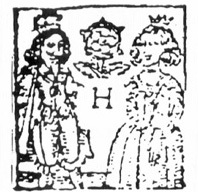 In any case, the selection in 1679 of an available factotum which depicted a Stuart king and a pretty crowned lady served the ends and the special audience of this particular presentation version of the poem; with its few amendments, chiefly the (minimized) moustache of the King figure and the (lighter) hair tones of the crowned woman figure, the factotum suggested the poem's two principals: Charles II and Lady Mary Villiers in her ducal coronet. (2) Authorship: Returning to the new find, namely the appearance of the 1679 factotum in the 1663 Seven Wise Mistrisses, the authorship of this 1663 book suggests two attractive candidates: both are named Thomas Howard. The epistle dedicatory is signed "Tho. Howard"; and the author identifies himself in his Note to the Reader as the compiler of the volume's many tales of exemplary women. The more sensible candidate for the book's authorship is Thomas (Howard), Earl Arundel (1585-1646), as mentioned above, a learned and broadly-traveled individual with special interests in Roman history and Italian visual culture (R Malcolm Smuts, Oxford DNB ), thus making the 1663 book a posthumous publication. Arundel was familiarly the 'father of Vertue in England,' and virtue (especially as displayed by certain women in Ancient Roman history) is indeed the overarching theme of "Tho. Howard"'s Note to the Reader in this 1663 compendium. Mary Wright's (or her printer's) choice of the earlier factotum, displaying Charles I and Henrietta Maria, was not inappropriate in a (posthumous) book of 1663 as its author was a prominent member of that earlier generation of Stuarts. This particular choice in factotum also presses a parallel comparison between Arundel's English queen, being the Henrietta Maria figure of the factotum, and the Roman model of exemplary wives, namely the Empress Lucretia, whose chapter this factotum ornaments. A second candidate for the authorship of the Seven Wise Mistrisses by this "Tho. Howard" is none other than Colonel 'Northern Tom' Howard (d. 1678), lieutenant of the yeomen of the guard, younger brother of Charles Howard, first Earl of Carlisle, and husband in 1664 of Lady Mary Villiers. (The amusing convergence of these related facts may be a delicious coincidence or something rather new and exciting.) As documented earlier in this archive, the couple was married in a clandestine ceremony in 1664. Although Mary Villiers' 'Tom' Howard was a famous libertine and fatal duelist prior to his amour and eventual marriage to the then-widowed Mary (Stuart née Villiers), Duchess of Richmond, the EEBO does include a few (literary) records by a Thomas Howard at this time, including the Seven Wise Mistrisses, which reasonably could have emanated from this third husband of Mary Villiers, such as (i) a ballad, An Old Song of the Old Courtier of the Kings… (London: F. Coles, 1670; Wing H3011; 1 sheet; signed at the end of the lyric, "Written by T. Howard, Gent. "); and (ii) An Elegy on the Death of the most Illustrious Prince [Henry, Duke of Gloucester, 1640-1660], third Brother to our most Gracious Sovereigne Charles the Second … (London: W. Gilberson, 1660; Wing H3007; 1 sheet), signed, "Tho. Howard". The 1663 Wright imprint, the Seven Wise Mistrisses, carries the identical author signature: "Tho. Howard." The six Howards profiled in both the old and the new DNB were not flourishing when The History of …the Seven Wise Mistrisses was published by Mary Wright in 1663; 'Northern Tom' Howard was indeed alive and flourishing at this time, and some of these (catalogued) literary pieces by a "Tho. Howard", especially the Stuart Elegy and the Stuart courtier's Old Song, might be said to coincide with his tastes and political allegiances. While current bibliographical data on the authorship of the Seven Wise Mistrisses, in the OCLC, the EEBO, and the ESTC, are sparse ("17th/18th century, a writer of Roman stories"), there is no denying the obvious coincidence of the publication date of this very "female" and matrimonial book of 1663 by a Thomas Howard -- surely a book to please any new wife -- and Colonel Thomas Howard's marriage (1664) to Mary Villiers (see D'Aulnoy, Memoirs of the Court of England [Paris, 1695; English ed., 1913], pp 234-6, 241-2, passim; Freda Hast, Oxford DNB 2004). There is also the fact that Thomas Howard, 14th Earl of Arundel, an individual "preoccupied with genealogy and titles of nobility" (Smuts, ODNB, as referenced above), did not typically identify himself in print as merely "Tho. Howard"; he is "Thomas Earle of Arundell" (Laws and Ordinances of Warre [Newcastle: Robert Baker, 1639]); or "Arundell and Surrey; Marshall" (The True Copy of a Letter Sent from Thomas, Earl of Arundell…to Mr Pym [London: John Thomas, 1641]); or, "Thomas Arundell" (The Confession and Conversion of…Sinners (London: J. Hayes, 1662; Sig B). Finally, had the Seven Wise Mistrisses been a posthumous publication of the pre-eminent Earl of Arundel, would not Mary Wright, Arundel's posthumous publisher in 1663, have exploited this impressive new property of hers on the book's title-page or in a note to the reader? It is difficult to believe that a volume of such pedigree and popularity (12 printings alone in the 17thC, being the 37-year time span 1663-1700) would have gone uncatalogued these three centuries as the work of Thomas (Howard), Earl of Arundel, a rather finely documented figure in English politics and culture. Yet he does seem to be the more satisfying candidate for the authorship of the Seven Wise Mistrisses, owing to his broad ties to Rome and to Italian history, and his recorded writerly leanings toward the didactic. In any case, the choice of this particular factotum (or style of factotum) for the 1679 presentation copy of the Popish Plot broadsheet poem to Charles II certainly links this anonymous poem of 1679 to the Howard book of 1663 and to the Howard name. In 1679, the 'Ephelia' poet, very probably Mary Villiers, had been a Howard (Mary, Lady Howard) from 1664 until 'Tom' Howard's death in 1678. The retention and use of her (public) ducal designation, "Duchess of Richmond and Lennox," was a special privilege granted her by the Crown after the death of her second husband, James Stuart, in 1655. Regardless of these contestable and perceived differences in the appearance of this factotum (or variants thereof) in 1660, 1663, and 1679, it is the contextual, allusive resonance of the two figures in the 1679 factotum which confers upon this particular device a special role in the closely held poem to Charles II on the Popish Plot. And it is this 1679 factotum, with its signification in the poem's author, its 'Lady of Quality' (Mary, Duchess of Richmond), which makes the authorial statement in this complex situation in 17th-century English printing history. Mindful that this presentation copy of a sensitive political poem to Charles II on the Popish Plot was printed for a small, élite readership, it is entirely reasonable to infer that the King figure in the 1679 "H" factotum (he of the modified moustache) and the attractive, vivacious woman figure in the 1679 factotum (she of the lighter hair tones) were seen and 'read' by their special readership in 1679 as none other than Charles II and the 'brisk and jolly' Duchess of Richmond. . In this densely formatted sheet of printed text, it is the image (the illustrated factotum) which draws attention: the eye of the reader engages initially with image, not text. Contemporary readers of this poem already saw this broadsheet, in its original state, in 1678; they already were familiar with the title's large, dramatic type size. What would have struck them as new and interesting would have been the image which was newly added to the text. What selected Court readers of this poem (reasonably) saw in that image were two 'miniature' figures which they would have recognized from first-hand acquaintance. Styles of dress, facial hair, and printers' inking practices notwithstanding, the two figures in the 1679 "H" factotum were intended to represent them: the poem's royal addressee, Charles II, and the poem's highly-placed "Lady of Quality," Duchess Mary in her ducal coronet. The ornament stock of most Restoration printers was a small, miscellaneous assortment of both new and old devices: tailpieces, fleurons, vignettes, proprietary printer's devices, borders, initials, and (multi-purpose) factota. This was a small, inky brotherhood of tradesmen, who regularly exchanged, transferred, borrowed, sold, inherited, and copied one another's ornaments. Factota were used rather blithely by Restoration printers, often none too appropriately for the book or broadsheet they ornamented; but in this instance, namely the 1679 presentation poem to Charles II, we may observe a special set of circumstances which suggest a compatibility of illustration and literary text, if not quiet authorial intervention. According to the present case, Mary Duchess of Richmond ('Ephelia', also known to her coterie as 'the Butterfly') was quite particular about the presentation of her work in the print medium; she ingeniously used, for her own amusement and that of her élite coterie, graphic devices as quiet signs of her identity: thus, the mark of the butterfly on the title-page of Female Poems…by Ephelia (1679; printer, William Downing). (A successful tracing of the original of that compelling mark to the book arts of the 17thC Dutch print culture is reconstructed in the author's illustrated essay in ANQ [Summer 1999]). For very good reason, the slightly emended and enhanced factotum of 1679 was not reused or copied or even adapted by the printer William Downing in the poet's publicly available book of that same year, which included this same Popish Plot poem to Charles II: the ornament was too articulate, it revealed too much about the book's pseudonymous author. This second, earlier location of the 1679 factotum, namely in the Wright imprint of 1663 (Howard's Wise Mistrisses) was mentioned via an e-mail message to ESTC/NA on July 12th, 2005. Further information will duly be posted to this Addendum as additional information and thus refinements come to hand. May the reader forgive the overbearing length and detail in this lengthy Annotation and Addendum; what appeared to be a rather uncomplex situation in 2001 was revisited in 2005. Owing to the wise comments of many good colleagues, this first investigation into some of the threads in this busy tapestry has been constructive: new historical facts have come to light and some reasonable inferences have been tendered on an engaging situation in late-17thC English printing history. The author is grateful, as ever, to Hugh Mowbray Jones, presently in Wales, whose knowledge of all things Villiers is profound. She also acknowledges Harold Love, who brought to her attention, in correspondence of late May/early June, 2005, certain (contestable) physical details in the "H" factotum of the 1679 broadsheet poem; that exchange proved constructive, as the author then traced, with the expert assistance of Douglas Peacock, Research Librarian, University of Michigan Ann Arbor/Early English Books Online ("EEBO")/ProQuest, one of two precedents, to date, of the 1679 "H" factotum, in a 1660 imprint in the Thomason Tracts. (A second location of the factotum, in a 1663 imprint of London printer Mary Wright, was discovered by the author rather by chance.) The author also is indebted to Diane Duell, Director, Web & Multimedia Services, Millersville University, Pennsylvania, and her capable staff, especially Michael Dulay, who responded promptly to this recent update; indeed, this ambitious multimedia archive could not have continued without Ms. Duell's expertise and interest. (i) In the print medium: published work on l7th-century English book history and the book arts, by Giles Barber, Philip Gaskell, Geoffrey Ashall Glaister, Richard Goulden, Arthur M. Hind, Ronald B. McKerrow, C. William Miller, Henry R. Plomer, Leona Rostenberg, Roger Eliot Stoddard, and the author's illustrated essay on 17thC printers' ornaments (ANQ, Summer 1999). (ii) In the electronic medium: Early English Books Online ("EEBO"), with the author's appreciation to Rochelle Ballard, Digital Coordinator, Princeton University; Kevin Carroll and Ed Yarnell, ProQuest/EEBO; and most especially Douglas Peacock, identified above in Acknowledgments. Passe-Partout (international database of printers' ornaments, Todai software), Polytechnic School of Lausanne, Silvio Corsini, contact; see http://translate.google.com/translate?hl=en&sl=fr&u=http://bbf.enssib.fr/bbf/html/2001_46_5/2001-5-p73-corsini.xml.asp&prev=/search%3Fq%3Dsilvio%2Bcorsini%26hl%3Den%26lr%3D. The website of the National Portrait Gallery, London, for images of Charles I, Charles II, and Queen Henrietta Maria. Online replies to the author's posted queries (June, 2005) over three list-servs: SHARP, BOOK-ARTS, and EX-LIBRIS. (iii) Solicited information, via telephone and e-mail, from librarians (UK, US), as well as from selected colleagues and practitioners in the trades (graphic artists and book dealers), with special gratitude to Philip R. Bishop (Mosher Books, Millersville, PA.), Alvan Bregman (University of Illinois Library, Urbana), Linde Brocato (AZ. ), John P. Chalmers (Chicago), Ellen Cordes (Beinecke Library), Rebecca Federman (NYPL, Rare Books & MSS), Patricia Hargis (ESTC, University of California, Riverside), Michael Inman (NYPL, Rare Books & MSS), Karen Limper (British Library), John Lupia (New Jersey), Philip Milito (NYPL Berg Collection), Paul Needham (Scheide Librarian, Princeton University), Fernando Peña (Grolier Club Library, NYC), Sergeant Robin B. Sternberg (NYPD), Steven Tabor (Curator, Early Printed Books, Huntington Library), and Sarah Wheale (Bodleian Library).